The photo of the two houses, 62 and 64 High Street was taken in 2011. Number 64 is the house on the left. 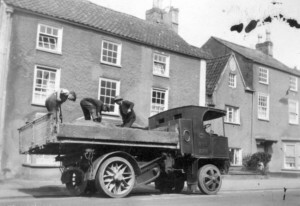 The older photograph below shows a steam lorry in front of the two houses. Click on the thumbnail to see a larger image. The Cooks and the Sanigers – the 1851 census shows that John Cook was sharing the house with his wife and the family of their daughter, Mary and her husband, John Saniger (see below). The census shows that John Cook was a ‘butcher – out of business’, so presumably this means he was unemployed at the time. He was aged 65 and born in Westbury. His wife was ‘Mary’ aged 54 (note she appears to have been Fanny on the marriage record and on the 1861 census record). John Cook was born on 20th April 1785 and baptised at Thornbury on 4th May 1785. He was the son of John Cook and his wife, Jane, who lived at Sibland. On 20th July 1809 John Cook married Elizabeth Neale in Thornbury. They had at least four children before Elizabeth died aged 35 and she was buried on 10th October 1818. The baptism records of the children show that John was a butcher. John married for a second time on 22nd April 1822. His second wife was Fanny Nichols. The deeds of Park House indicate that John may have been living at the adjoining property (the one we now know as the White Lion 10 High Street) at some time between 1820 and 1840. The 1841 census shows John (aged 54), Fanny (aged 44) and their daughter, Mary (aged 24), all living in Kington. On 21st July 1844 Mary married John Saniger, a labourer and the son of William Saniger. John died 28th December 1852 aged 67. He is buried in St Mary’s Churchyard along with his first wife, Elizabeth, son Joseph and daughter, Eliza. Fanny was still sharing the house with John and Mary in the 1861 census when she was described as a shopkeeper aged 66 from Winterbourne. S he may be the Frances Cook who was noted as being aged 72 when she was buried on 1st November 1865. Eliza who was born on 4th April 1810 and baptised on 8th July 1810. Eliza married Robert King of Morton. She died 31st March 1875. Joseph was born on 2nd March 1812 and baptised on 2nd September 1812. Joseph died aged 30 and was buried on 19th November 1832. Ann was baptised on 8th October 1818. John Saniger – John was born about 1815, the son of William Saniger. The census records shows that he was born at Sundays Hill, Falfield. On 21st July 1844 John married Mary Cook, the daughter of John Cook, the butcher and his wife, Elizabeth (see above). The 1851 census shows John was an agricultural labourer and that John, Mary and their three children (Elizabeth aged 6, Charles aged 3 and Mary aged 5 months) were living at 62 High Street with Mary’s father and step-mother. In the 1861 census John was still an agricultural labourer, now aged 46. He and Mary had another child, Fanny aged 1. They were sharing the house with Mary’s step-mother, Fanny Cook, aged 66 who was described as a shopkeeper from Winterbourne. We know that the house was put up for sale in 1870, along with 62 High Street, and it was described as a shop. The 1871 census shows the Sanigers were still living there. John was still working as a labourer, but Mary was now running a confectioner’s and seeds shop. Three of their children were at home: Elizabeth a dressmaker aged 26, Charles, a plumber and glazier aged 23 and Fanny aged 16 helping her mother. John and Mary carried on living at the house until their deaths. John died aged 62 and was buried on 21st February 1877. Mary died aged 70 and was buried on 2nd February 1885. Charles Trayhurn – the 1880 Rate Book and 1881 census shows the house was then occupied by Charles Trayhurn. The census shows that Charles was a journeyman tailor aged 52 and he was living there with his wife, Joanna aged 52 from Dursley. Charles was born in Thornbury about 1830. He was one of the many children of John Trayhurn, a tailor and his wife, Hester They lived in Chapel Street. By the 1851 census Charles and his brother, Henry, had become tailors like their father and they were still working with him in the house in Chapel Street in the 1861 census. By 1871 Charles was the only son working with his father. Charles was then aged 41. On 1st June 1872 Charles married Joanna Allen, the daughter of Jesse Allen, a butcher and his wife, Hannah. In the 1871 census, Joanna had been a dressmaker lodging with Mary Organ, a licensed victualler in Newport near Berkeley. Initially Charles and Joanna carried on living at Chapel Street, but by the time of the 1880 Rate Book they moved to 64 High Street. The 1887 and 1890 Rate Books show ‘Mrs Williams’ as being the occupant. The reason for this is explained in the 1891 census which shows Charles had been admitted to the lunatic asylum at Gloucester. Joanna was living alone in 64 High Street. She must have been carrying on Charles’s business as she is described as a tailoress. In 1897, Charles died in Gloucester aged 67. Her brother Thomas Allen who lived in Bournemouth and was said to be of independent means seems to have been rather defensive about the event. He explained that he made his sister an allowance “more than sufficient for her needs” and that she had chosen to live alone in the small house although he had invited her to live with him. Leonard Rugman who was fourteen years old had been in the habit of running errands for her and he had called several times and got no reply. The Coroner’s jury decided that she had died accidentally of burns, seemingly whilst trying to light the fire. There is a long gap in the history of the house after 1926 when we don’t know who lived there. The Edwards – from about 1935 to 1948 the house was occupied by Trevor and Florence Ada Edwards. Trevor came over from Wales to work on the erection of telegraph poles and later worked as a maintenance engineer in the telephone exchange at Temple Meads. Trevor was born on 13th May 1910. In 1933 he married Ada Florence Western in the Bristol area. She had been born on 20th November 1909. They had moved to Thornbury by 1935 when their first daughter, Rosemary was born. They went on to have six more girls: Evelyn, Margaret, Esme, Miriam, and twins Christine and Kathleen. In 1948 they moved to larger premises when they were allocated a three bedroom council house at Market site (now Bath Road). Roland Payne – Roland and Mary F Payne were listed as living at 64 High Street in the 1958 and 1961 electoral registers. In the 1965 and 1970’s registers just Roland is listed. We don’t know a great deal about Roland. He appears to have been born in 1901. According to a family tree noted on Ancestry website Roland would be the son of Giles Payne, a shepherd, and his wife, Ada. In 1926 Roland married Mary F. M. Screen. They had two children, Stanley G born in 1927 and Dulcie M born in 1934. We know from neighbours that ‘Rolly’ was living in the house in the mid 70’s and at that time he was a gardener working at St Marys School. Since the 1980’s the house has changed hands a number of times. The owners and occupiers include Bernard Hones who bought it in 1979 for his mother to live there, Deborah Jane Brooks (who gave the house the name of ‘Pollibrook’), David Anderson, Ian Macgregor. In 1999 it was acquired by Peggy Barbara Bartholomew whose daughter, Jenny Dicker lives at 58 High Street.